I stated many times (like in this slides) that between being featured or not on Android Market (now Google Play) means to Fly or Die. While I believe that Android Market has too many screens and lists to the point that is confusing to the users and many of these screens are too many clicks and swipes away that they are barely reached, that is not the topic of this post. Today I want to talk about the stages in being featured inherent to this hierarchical structure. It goes from more to less. I have classified them according to Dragon Ball Saiyan states, to emphasize the power gap. 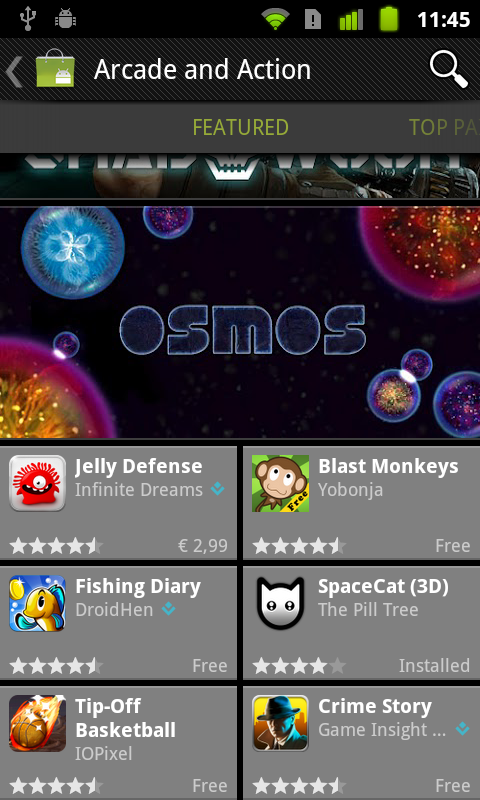 When new featured titles appear, they are usually put on the big banner of the web and also the main screen of the app. This is the first screen users see when they open the market and -I suspect- it has a huge impact. Needless to say, when you are featured on the home page, you are also featured in the category and subcategories and you appear in the Staff Picks list. Unfortunately I can’t give you figures about this because SpaceCat was featured directly under Games, but feel free to extrapolate the results from the other cases. This is the screen when users go to find something specific. Fortunately for us Games has an entry from the homepage and it is one of the most visited screens of all the market. SpaceCat was placed there for around 2 weeks, sometimes as a big banner, sometimes as a small one. Being there we averaged 50k downloads per day. 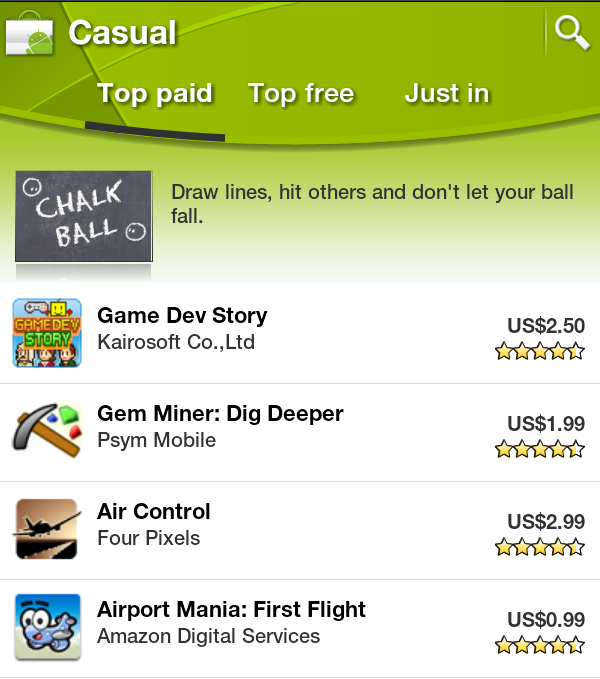 Mind you, SpaceCat is a Free to Play game, a paid app will have a lot less downloads -as we experienced with Chalk Ball-. Still, 50K downloads a day is totally massive. To put it in context SpaceCat had 50K downloads in total from the previous 6 months, including more than 10 blogs reviews, so yes: WOW. Of course, during this time you are also listed on the subcategory and in the Staff Picks, which just adds to the number of downloads. Once you had your time here, it is time for some fresh meat, so you will logically be pushed to be only in your subcategory and the staff picks list. During this period we averaged 15k downloads a day. That is half what we got per day when Rabbit and Eggs (an Easter themed free game) was featured on the Main Page during Easter 2011. The number of Android devices out there has grown a lot over the past year. With the figures of past Easter and now I can say that the number of potential users definitely has grown in the same proportion. Then, after the standard month period, your app will be removed from the Staff Picks list, but will remain on the subcategory for a while longer. Thankfully there are more spots now on Android Market and you are not pushed completely out at that moment. This was a bit surprising bit for me. When the app was pushed out of the Staff Picks, but still on the subcategory, we observed a drop to “just” 5k daily installs. I was expecting the importance of Staff Picks and subcategory to be the opposite. Although that is just 10% of what we got on the first stage, it means a lot of downloads and as an indie developer I appreciate this slow decrease in popularity and downloads instead of the sharp drop we experienced a year ago with Chalk Ball. Although 5k downloads a day sounds small when you come from being on the top, it is still a very good amount of downloads you are very unlikely to get from any other place. Note: Platty Soft is the current company responsible for the games of The Pill Tree.